Today, I've got another sewing project and pattern for you. This time I've got a table runner pattern for you. I had never made anything like this before and just made it up as I went along. So, there may be a better more ‘official' way to make a table runner, but this worked and was fairly easy, which is always something I like. As long as I was going to take the time to make a table runner, I decided to make mine reversible. That way I get two table runners for the time of one…like, like and like! This table runner pattern is pretty easy, in other words, if you can sew a straight (or mostly straight) line, you can make this. To start, I measured my table. My table is 63″ long and 40″ or 42.5″ wide (the wider is if you include the decorative parts that jut out). I knew I wanted my runner to hang over the edge of the table by 2-3″(I think it ended up longer than that, but I like the look, so it all works). I cut my fabric at 69″ by 15″. If you want to make your own with the same amount hanging down, measure your table and add 6″ to the length. Decide on the width that would look good on your table. I wanted my finished table runner to be 14″ wide. I added 1″ for the seam, making my cut 69″ x 15″. If you are making your table runner reversible, cut out two pieces of fabric the same dimensions. Next, we need to work on the ruffle at the bottom of the table runner. I wanted my finished ruffle to be about 3″ long. Knowing that extra fabric would be taken with the ruffling process, I cut my coordinating fabric 5″ long. I almost doubled the width of the runner to get a nice ruffle. I cut my ruffle pieces 28″ x 5″. To make yours, double the width of the table runner and cut 5″ long. To make a ruffle, first iron and hem your fabric on three sides. I used a .5″ seam allowance. 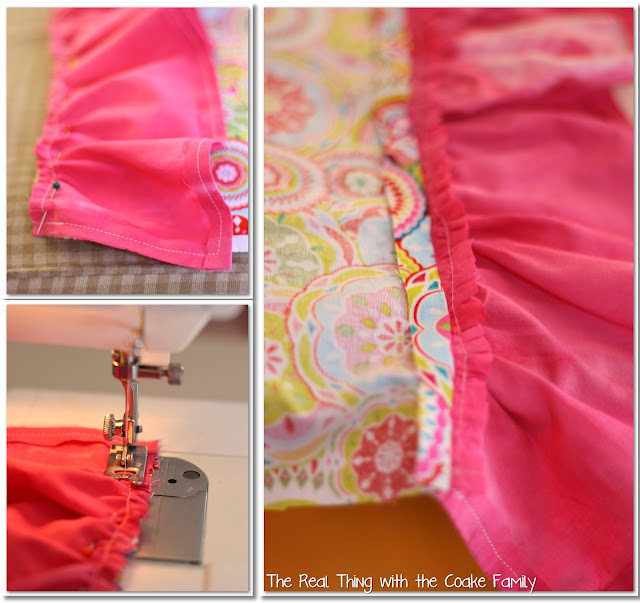 Then, change the setting on your sewing machine to the widest stitch you can make. Stitch across the top of your fabric being careful NOT to back-stitch. To gather the fabric and make the ruffle, you pull gently on one of the threads you just sewed, at the widest stitch, while gathering and/or gently pulling the fabric back. Usually you will find that one thread will pull easily and the other doesn't seem to want to move. Just try your best to do this gently so that you don't rip the thread and have to start over. Once you have ruffled/gathered the fabric to the same width as your table runner, make the ruffle as even as possible and pin it to the end of your cut long piece for the table runner. You are pinning the right sides together. Make sure to switch your sewing machine stitch back to its normal setting. Sew the ruffle in place, being careful to sew far enough away from the ruffling thread that it won't show on the right side. Turn and press your seam. 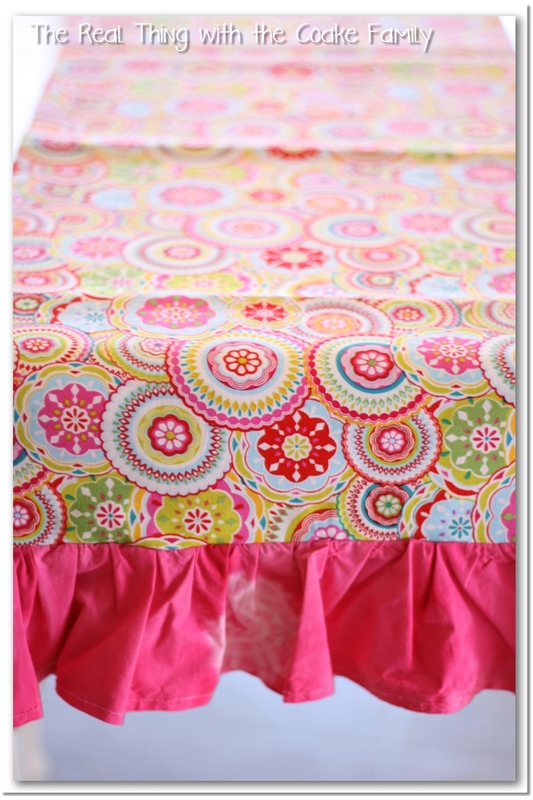 Do this 4 times to add a ruffle to each end of your two pieces of fabric for your reversible table runner. 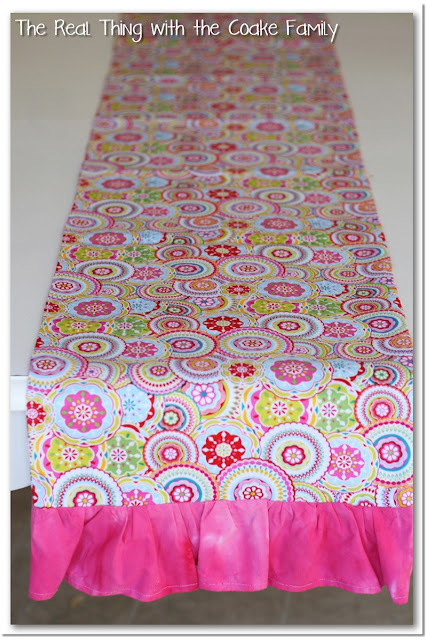 Pin the right sides of your table runner together and sew using a .5″ seam allowance the full length of the runner (including sewing the ruffles together). Carefully press the seams so that when you turn the table runner right side out, it will lay flat and you won't be able to see the fabric on the other side. Voila! Valentine's table runner!…or…is it a spring table runner? It is both. Which side do you like more? The Valentine side of this table runner is part of a Valentine's tablescape/centerpiece I am working. I will be showing you the rest of that next week! Of course, if you saw my printable Valentines post, you may have caught a glimpse of one of the other elements making its way into my Valentine's table and decorations. I love the ruffle at the end!! It’s so pretty! I need to make a table runner for our dining room table. Thank you, I love the ruffle, too! 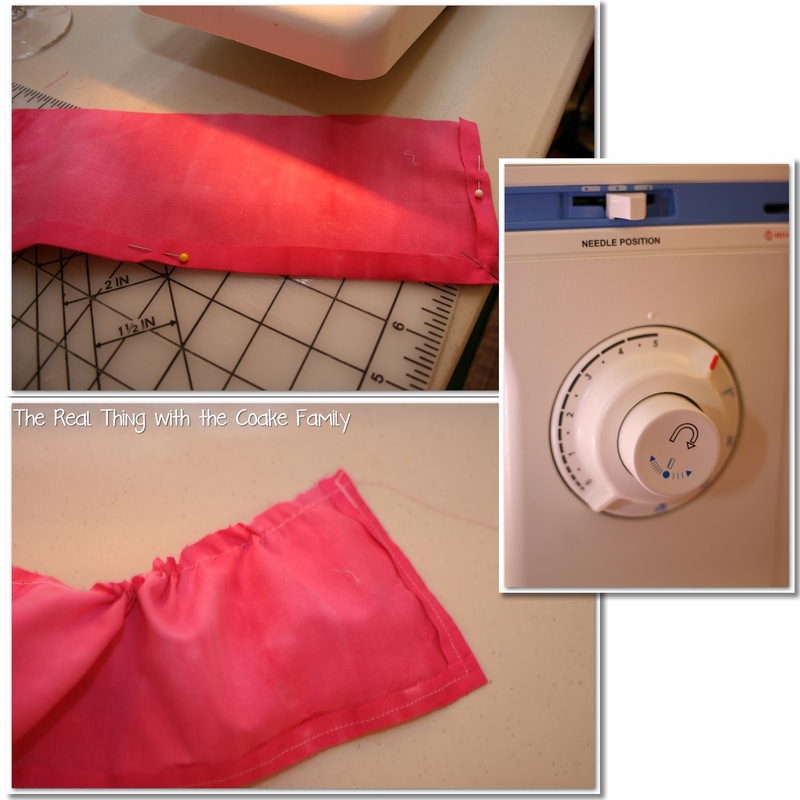 It was surprisingly easy to make…so if that is what has kept you from making yours, know it is a very do-able project. Cute fabric. I’m pinning this for future sewing project inspiration. Thanks! Thank you! I hope your future project goes great! You are so smart! What a great way to get two different looks for your table! I’ve got to try this! Thanks so much for sharing! Have a great weekend! Thank you! It was pretty easy, too…gotta love that! Have a great week. 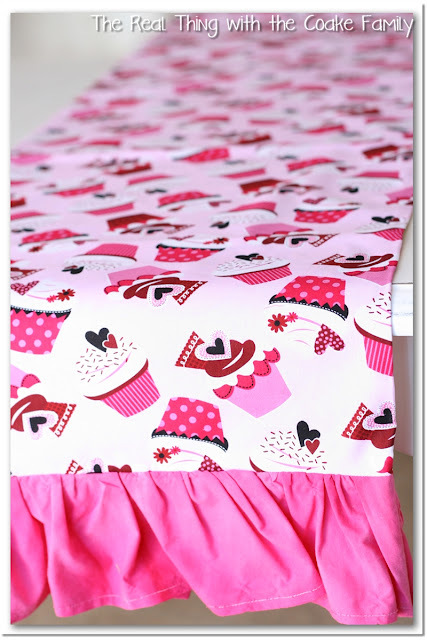 I LOVE that it is reversible….you get so much more bang from your buck! Well done! Yep, works wonders for me. Saves on storage space, too! Great idea! Especially around the holidays when decor changes so fast! That is true…hadn’t thought of how quickly we often change decor this time of year. Great Tutorial! You have a beautiful blog and I am your newest follower! Please visit my blog and take a look around. If you see something you like, I would love for you to follow me back! Gorgeous table runners! I love both fabrics! Thank you! I had fun choosing the fabrics. Clearly I like bright colors! Such a great idea!! Love them!! Too lovely idea!!! 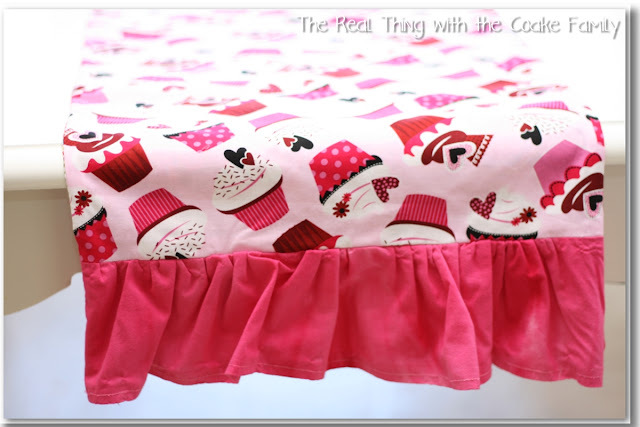 Love the Valentines fabric and the ruffle! Thanks so much for sharing the great tutorial! Would love to have you visit me sometime. Thanks, Ana. I love the ruffle, too. It is fun! This is great and I’m totally going to steal it! Thanks for the inspiration!! Stopping by from Home Stories A to Z’s linky party. Love this. I may to try it if I can get my sewing machine to work. Thank you for sharing. Thanks! I hope you get your sewing machine to work. Mine wasn’t working for the longest time. I finally took it to a sewing repair machine place. The older man did a great job, I just had to listen to his stuff about how they don’t make things like they used to and such and so on! Thanks! I totally agree, it is like getting 2 for only a small amount work more. Works for me! Very cute! I love table runners! Great post! Very cute! Nice work. I love table runners! 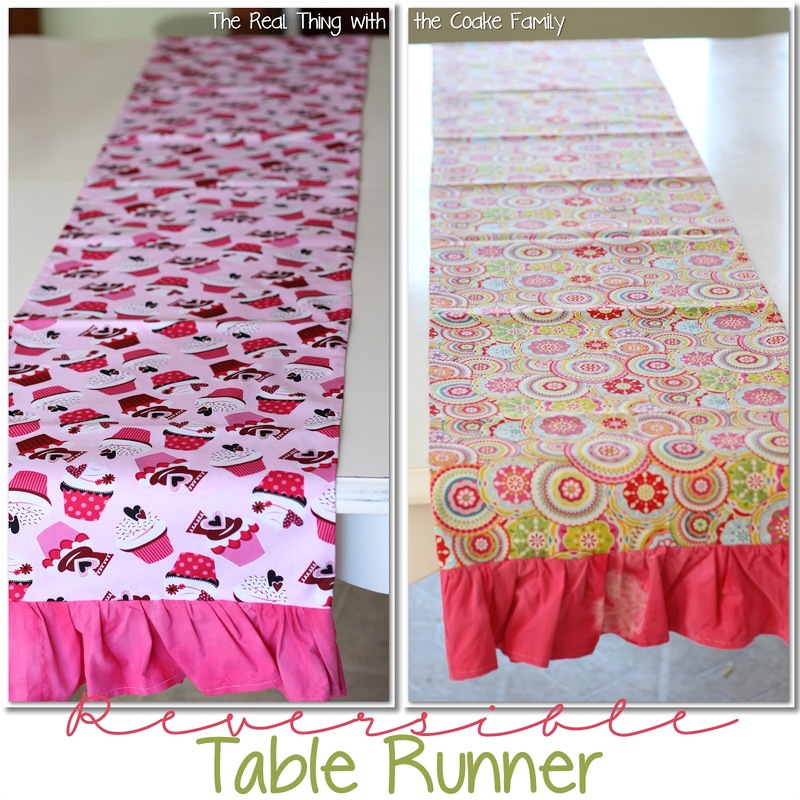 Great idea to make the table runner reversible and the ruffle finishes it off well. I love those fabric patterns, where did you get them from? It’s been so long, I’m not sure I remember. I think JoAnn’s but it would have been well over a year ago. Hope that helps!